The Active Engine Brake is a driver assistance system developed by Nissan Motor Corporation. This system assists the driver in reducing the speed of the vehicle smoothly without putting much strain on the conventional brakes of the vehicle. It is also different than modern day adaptive brake technology. Usually, in an ordinary vehicle, the driver applies brakes when he/she wants to reduce the speed of the vehicle. If the vehicle speed is not reduced to the desired level, the driver has to apply brakes again. This is the external measure of reducing the vehicle speed through the engine which is generating the power uninterruptedly. 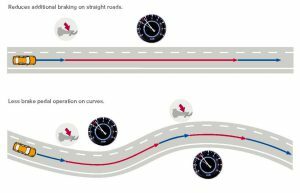 How the Active Engine Brake Works? This is where the active engine-brake comes into play. It works on the principle that if you reduce the power generated at its source, then it will automatically reduce the speed of the vehicle without putting much strain on the external means like brakes. Thus, the system continuously monitors the vehicle speed, the road ahead and brake & steering inputs given by the driver. Based on this information, the system continuously analyses the driving environment. And thus, it determines when the driver desires the reduction in the speed of the vehicle. Then, the system automatically curbs the engine power. It offers a better control of the vehicle in critical situations in a more stress-free way. It does so in situations such as maneuvering a tight curve. This particular technology i.e. Active engine-brake technology by Nissan employs a technique of reducing the power. It does so by adjusting gear ratios with the help of CVT. VVT: What is Variable Valve Timing And How It Really Works? What Is Sync brake system Or SBS & How It Works? What Is SEP Technology By Suzuki And How It Works? How Does An Air Cooled Engine Work? What is Disc Brake, what are its types And How it works? Know Here. What is Mercedes Benz Digital Rescue Assistant?